This year, at the Ontario Libary Association Super Conference, I presented Ad/Lib’s Library Marketing Year in Review for 2017. It featured library marketing that caught my eye or was recommended to me, while other content was solicited directly from a variety of libraries across Canada. The goal of the presentation was the same as the website: show off great ideas and provide inspiration. I’ll be sharing the content of that presentation over a series of posts. Content presented in no particular order. 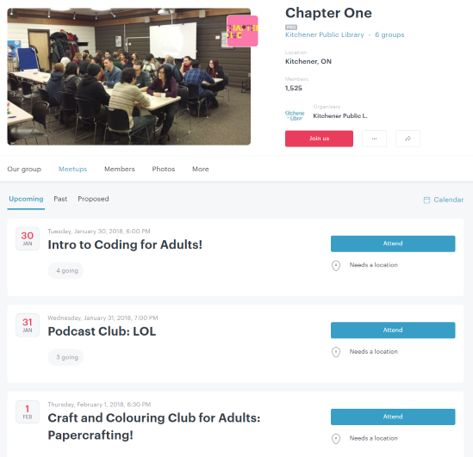 This is continued from Part I.
Kitchener Public Library identified a challenge, as described in Urban Library Council, “As we looked around our library and event attendance, we knew we were missing a vital voice; the young artists, designers and entrepreneurs in our community. 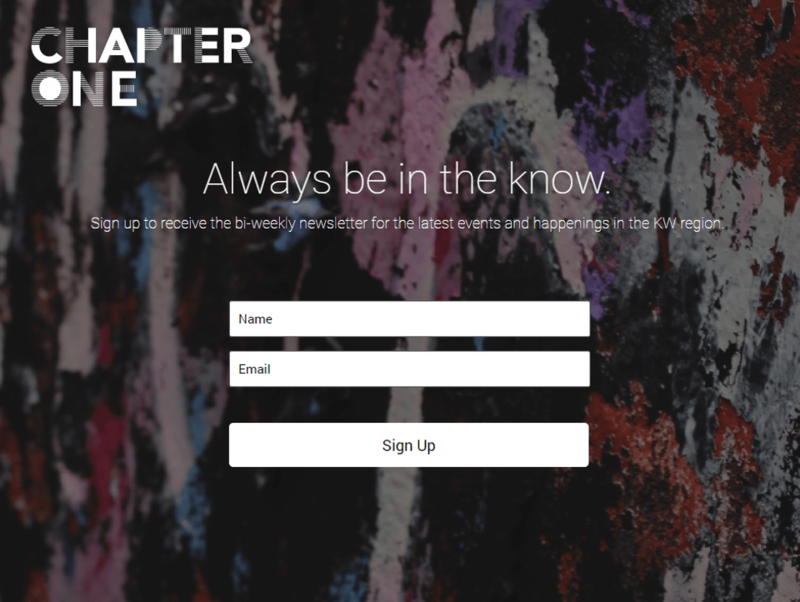 With “Chapter One,” we want to start a conversation that allows millennial customers to tell their own stories via blogs, social media and e-newsletters.” KPL worked with the local agency HIM and HER to prepare initial design work (including the logo, above) and set-up some of the key components of the campaign. …and an Instagram with content aiming to appeal to a younger age demographic. I had to include Kitchener Public’s top tweet, a great take-down of the ignorance of UK politics writer Andre Walker. This one tweet had >210,000 impressions and >12,000 engagements. We have about a million in-person visits every year + 2 million uses of digital services. 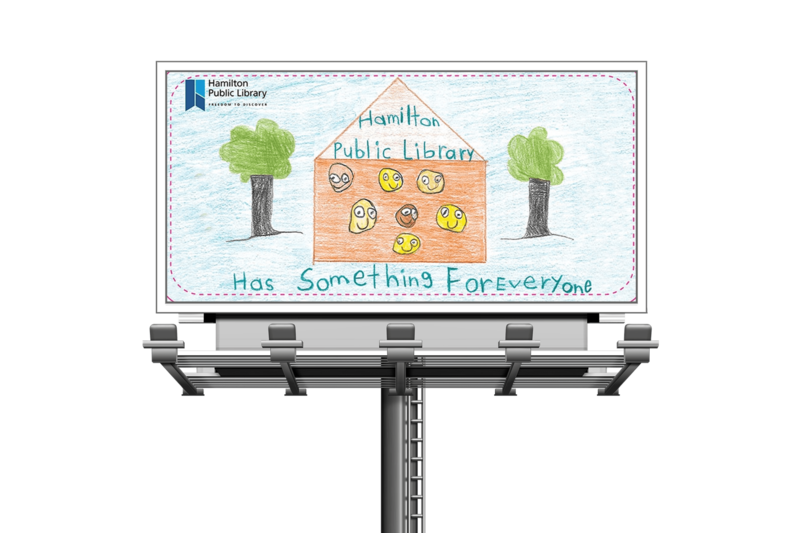 Each year, Hamilton Public Library runs a contest for local children, ages 3-13, to create an illustration that represents what the library means to them or promotes reading and literacy. The winner has their image blown up to billboard size and put up on a main thoroughfare for two weeks. I have a soft spot in my heart for this campaign because I drove past it every evening while it was up in 2017. HPL partners with a sign company and the billboard owners to make this happen. Full contest details on the website. 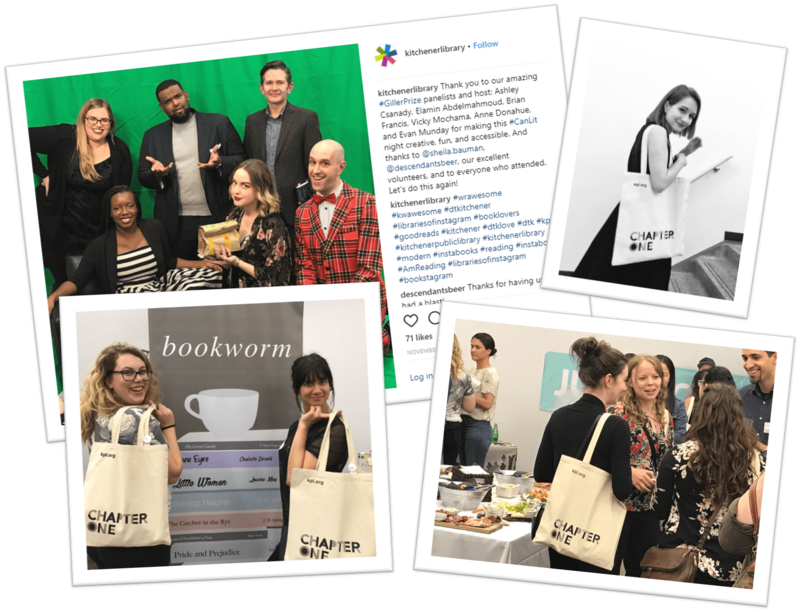 I ran into colleagues from UofT, Jesse Carliner and Heather Buchansky, at a couple of conferences this year, where they were sharing an easy social media approach that had high engagement and is easily replicable by other libraries: “the journey of the book”. A video and photo essay was created at the same time, and was easily shared across multiple social media platforms. Twitter alone saw 30,000 impressions, and over 400 engagements. One of the things that TPL did his year that generated a lot of buzz in my online community was an AMA (Ask me Anything) on Reddit – after a successful test run on local subreddit r/Toronto, TPL scaled up and ran a second AMA on r/Books, a much bigger subreddit (14.2 Million subscribers!). I haven’t seen a lot of libraries engage much with Reddit, which has a passionate and engaged user-base, largely untapped by libraries. I reached out via Reddit to the TPL account and connected with Bill Vrantsidis. Here’s what he had to say: “Generally Reddit drives much more traffic to our blogs – and we use it a lot for visual material – but limited to Toronto focus. We’ve also posted onto r/vinyl and r/leafs. We did have a 2nd AMA on r/books for Freedom to Read week in Feb 2017 – it was one of their top AMAs that year. Reddit reaches folks who aren’t as familiar with our services – it’s been very successful for us.” Finally, Bill notes that there are a lot of university subreddits that are potential outreach opportunities for academic libraries. A clever idea that Toronto Public Library had this year was to map out all of the Toronto neighbourhoods with the book that was most borrowed. The original image was hyperlinked so that users could click the map to find the book in the catalogue. This idea generated enough immediate interest that it was picked up by local news outlets.